Die Ausgaben für Werbeanzeigen in Social Media werden von 2010 bis 2015 um ca. 300% ansteigen, so das Medien-Forschungs-und Beratungsunternehmen BIA / Kelsey. Das entspricht einem jährlichen Wachstum von 31,6%. Anzeigen auf Facebook, Marktplatz-Werbung und Sponsoren-Beiträge sind inzwischen fast in allen sozialen Netzwerken vertreten. Display Ads (Facebook-Werbung) werden voraussichtlich auch im Jahr 2015 das vorherrschende Format ausmachen und mit 92,7% den Grossteil der Werbeausgaben darstellen. Der Bericht sagt auch, dass die Zahl der Nicht-Display-Anzeigen, wie zum Beispiel Tweets bis 2015 deutlich zunehmen werden. Was diese Studie nicht berücksichtigt, ist das Konsumentenverhalten im Jahr 2015 und in wie weit diese Werbeausgaben auch zum gewünschten Erfolg führen. Ebenfalls unbeachtet bleibt die Entwicklung der Social Media Landschaft in den nächsten 4 Jahren und ob Facebook auch 2015 noch die gleiche Rolle spielen wird wie heute. According to the media research and consulting company BIA/Kelsey, social media advertising revenue will presumably increase by 300% compared with 2010 and hit the $8.3 billion mark in 2015. This would mean an annual growth rate of 31.6%. In this study, social media spending is defined as money spent on advertising formats across all social networks. Display ads, known from Facebook for example, will be the predominant ad format in 2015. Also non-display ads – for instance Tweets – will play a significant role accounting for about $600 million of the entire social network ad spending in 2015. What this study is not taking into account, is the customer behaviour in 2015 and whether this increase in ad spending is going to bring the desired success to the ad spenders. It is also risky to assume, that the social media landscape and the role of Facebook will be the same in 4 years. Eine neue Studie hat ergeben, dass Einzelhändler E-Mail-Marketing am häufigsten nutzen, um zusätzlichen Umsatz zu generieren, Verbraucher zum regelmäßigen Einkauf einzuladen, neue Produkte einzuführen und Kundenbindung zu stärken. Die Ergebnisse sind Teil einer Befragung von 200 Unternehmern aus der E-Commerce Branche. Die Frage nach der Top-Nutzung von E-Mails beantworteten 91% mit “Zusätzlicher Umsatzgenerierung”, 89% mit “Erhöhung der Kauffrequenz”, 81% mit “Produkteinführung” und 80% mit “Stärkund von Kundenbindung”. • Levi Strauss bietet den kostenlosen Versand all jenen Käufern an, die eine Bestellung noch am selben Tag des Email-Empfangs aufgeben. • Sephora USA Inc. versendet personalisierte E-Mails an Geburtstagen von Kunden. • Der Einzelhändler für Haushaltswaren und Einrichtungsgegenstände Williams-Sonoma Inc bietet via E-Mail ein Treueprogramm an, dass Kunden nach einer einmaligen Zahlung von $30 dazu berechtigt, führ ein Jahr versandkostenfrei einzukaufen. • Forever 21, ein Modehaus für Frauenmode, lädt die Empfänger zum Schmökern auf dem Unternehmens-Blog ein und bietet ausserdem verschiedene Kontaktmöglichkeiten an. • Das Handelshaus für Bürobedarf Office Depot Inc. versendet Emails, um Kunden daran zu erinnern, häufig bestellte Produkte wieder nachzubestellen. With social media marketing, many retailers are tempted to forget the power of email campaigns and email marketing. But the good old email is still an indispensable tool for creating revenue, follow consumers, present new products and foster loyalty. According to a new study which analyzed the use of email among 200 business representatives, 91% said to drive incremental revenue, 89% said to increase purchase frequency, 81% said to promote products and 80% said to improve loyalty among the customers. • Levi Strauss offers free shipping to shoppers who order on the same day as they receive the e-mail message. • Beauty suppliers retailer Sephora USA Inc. is sending personalized e-mails on the birthday of their customers. • Housewares and home furnishings retailer Williams-Sonoma Inc. offers a loyalty program membership for $30, allowing customers to purchase products free of shipping costs for 1 year. • Women’s apparel retailer Forever 21 includes links to the retailer’s blog and contact / sharing information in their email. • Office supplies retailer Office Depot Inc. sends out messages to remind consumers to replenish stocks of frequently purchased products. Since Version 4.4.x the OXID e-Sales software has shipped with an exciting feature to empower a couple of e-business models over and above traditional B2C online-sales. Private Sales enables building shops targeted at a group of pre-registered users. This is useful for example for creation of premium sites such as Gilt.com, or the newly launched in Asia Vipcrazy.com. Similarly it accomodates for creation of shopping clubs. One of the great applications of Private-Shops is to build Business-to-Business (b2b) e-Commerce/e-Business sites – sites that are targeted to resellers and distributors who need to be pre-registered with the online-vendor. Any user wishing to enter a site is required to login before seeing product, prices, pictures etc, similar to what login-screen seen on this OXID-Demo-Shop. Once the user is logged in, she benefits from not only a private shopping area, but also Persistent Shopping-Cart. Assuming this feature is activated by the Shop-Owner, the shopping-cart remains persistent, which means products taken into the cart remain there for a specific period of time, irrespective of if the user logs out and then back in. The duration of persistence can be set in /admin by the Shop-Owner. Private-shops can be configured in OXID using the /admin-Area (refer to Demo-Shop). The settings can be found under Master Settings > Core Settings > Settings. Then choose Private Sales. Private Shopping can be activated/deactivated using the Enable/Disable setting. This setting restricts access to all the shop-pages, including products, customer-service pages and CMS pages. If this feature is activated, users will be forced to either finish the order, or empty the basket before then move on to shop in a different category. If enabled, shoppers will be able to login and logout of the site for a certain period of time, specified in next setting as number of seconds of validity period (1200 in example below). Overall the Private Sales feature in OXID is unique and allows to expand online-sellers’ business model beyond a simple B2C shop. For taking advantage of our OXID Programming Services to implement your Private-Sales business model, please call or email us from https://www.euroblaze.de/de/kontakt.html. 2010 erging es dem Onlinehandel insgesamt deutlich besser als dem lokalen Handel. Der Online Retail Index, stellvertretend für das Wachstum der e-Commerce Branche, verzeichnete ein deutlich höheres Wachstum als der Dow Jones. Ich bin gespannt, wie sich diese Entwicklung gegen Ende 2011 fortsetzen wird! According to the latest statistics, the e-commerce did much better last year than the classical stock market as a whole. 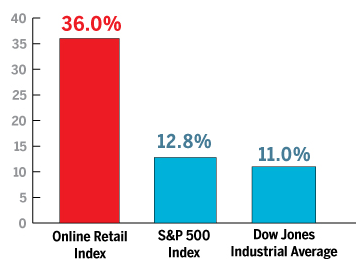 As you can see in the graphic to the right, the Online Retail Index, which measures the growth of online shopping based on data collected from online shoppers, easily tripled the Dow Jones Industrial Average, which reflects the stock market. I am curious about how this proportions will develop in the end of 2011! Let’s face it – we all hate registration forms. Baring the sick narcissist out there, normal Internet users hate to type in their name, email address, country, postal code etc, every time we want to gain deeper access into a website/portal/web-service. Programmers and community managers of Internet Portals, e-Commerce Sites and Blogs couldn’t have missed the newest authentication schemes offered by mega-communities like Google, Facebook and Twitter. Given the millions of users these communities have logged into their authentication databases, the idea is to offer this registration data as authentication-information for 3rd-party sites (like “Mom & Pop’s Screws Online-Shop”). In effect a user having an account with the major site such as Google, Facebook or Twitter would not need to register again to a 3rd-party site. They can just tie into the above mega-sites and perform the authentication over their servers. However some of these authentication-systems reveal more of your identity related data than is absolutely necessary to perform the authentication. As a frequent reader of the Mashable Blog, I recently was offered to sign up into the site for commenting on some blog-posts. The choice was of Facebook Connect and Twitter oAuth. You “basic” information, which beats the definition if they are letting out a list of all my friends, so that the 3rd-party site can use the Facebook Graph and extract personal data about all my friends. Gee, I don’t feel that much like a friend anymore, and who knows which friend of mine reveal my data to CRM/Marketing companies around the Net. Send me email anytime for anything. That’s not so terrible, but do I want more Email in my life? No thank you! Post on my Wall. If I think of my Facebook Wall as space where I can keep my friends updated about whatever is happening at my end, I really wouldn’t want 3rd-party sites to pollute it with all their marketing-info. Did you see the bomb on that screen-shot? “Access my data any time”? And in small greyed out fonts it says “Mashable may access my data when I’m not using the application”, which translated into clear-text means, Mashable can store my data and use it for their marketing (and other) purposes forever, even long after I quit using their site. The appauling part is that this is not what we sign up into when starting to use Facebook. Neither is it made clear when Facebook explains the feature to it’s users. Instead it is hidden away in the nitty-gritty of legal-text. Compare also the screenshots they have used in their explaination with a real screen we have captured above! Below is how a Twitter Permisison page for authentication looks like. Read tweets from my timeline: That’s OK, doesn’t hurt and I’m cool about sharing stuff – so be it! See who I follow and follow them? Wait, snoop on people I follow and start following them, without their permission? Again, for all the talk about Social Media, I can’t see what’s social about abusing my profile to be a multiplier for extracting information about my friends/followers! And finally, post tweets on my behalf? Oh my God!! What if this 3rd party service was run (or taken over, or infiltrated) by lunatics, and they post on my Twitter feed: “I love OBL-Osama and long-live Jihad?”, or if this service got hacked and messages get spewed onto my feed? Won’t I be answerable and liable to these posts, even legally? So why would I allow people to post on my page which bears my pic and name as its owner on it? As you see, both Twitter and Facebook’s authentication methods allow abuse of your online identity. It is hence our recommendation to users of Internet services to avoid authentication via Facebook Connect or Twitter oAuth, or at the least, read very very carefully on Permission Screens before clicking the innocent-looking “Allow”! We hope to soon post a similar review for Google’s oAuth system, so please stay tuned! Der Einkauf via Smartphone gewinnt zunehmend and Beliebtheit, doch neben dem eigentlichen Smartphone-Shopping nutzen Kunden ihr mobiles Endgerät auch noch für weitere Produktbezogene Zwecke. Eine neue Studie von BIGresearch fasst diese Anwendungsmöglichkeiten nun auch in Ziffern.